Happy New Year! 2010 had been a great year for brave new concepts in web design. Together with a handful more websites coming in existence this year is the increasing demand for new web ideas. What ideas would make the cut and convert to cash this year? We gathered a few tips together so you can welcome 2011 with a bunch of new concepts that’ll bring the house down. Don’t wait ‘til you hear them say “That is so 2010!” Get some key tips that are sure to get traffic goin’ for your website and score marketing points for your company. Simplicity is the new trend. Brush off too much complexity in your design and you’ll find yourself saving a lot of time. Create straightforward layouts with minimal colours – they are easier to manage and load a lot faster. Above all, they take fewer resources (can also mean cheaper to maintain) and bargain neat and relaxing feel to the eyes of the reader. 2. Wide layouts and huge typos in. Make the most out of the space you have available to you! That’s one of the biggest motivators behind having large website designs that are designed for larger screen resolutions, but still scale nicely for those people who are still using smaller ones. Still in, rather. Typography opens up more chances to communicate with readers and websites. Bigger fonts speak better than small fonts that irritate the eyes. Use tools like Typekit or Google Fonts, which have visually appealing and web-friendly fonts that are also search engine optimized. Other Web 2.0 Design standards provide richer and more captivating user experience with a choice of glossy, shady and solid block colors – all fashionable , not to mention that it seems irreplaceable at the moment. Web 2.0 is fast, stable and offers wide variety of elements and formats. 3. HTML5 and CSS3 are in. If my memory serves me well, HTML and CSS have been proliferating web designs ever since…hmm… well ever since websites come to age. Now on its 5th and 3rd generation, respectively, HTML and CSS promise to surprise us with something a little more than what we expect of them. Among a lot of new innovations, these two offers more ease and accuracy in building marketable websites. Embed your social media tools while flaunting stylish advanced typography together with built-in transitions and 360 degrees of virtual resolution. Aside from huge fonts, interactive designs are also in, using flexible images, audio and videos to create an interactive environment. Readers are keen on commenting to posts, forums or wherever posts can be made in response to another. A usual way to be interactive is to put up media queries and comment boxes. Be creative and incorporate designs that will boost this part of your site. 6. Editorial-style layouts are in. If you own an informative website that needs frequent updating and checking, then the editorial-style layouts are sure score you points on your marketing. This type of design makes use of grids to organize your details and maximize the spaces for content – leaving no dull white spaces around. More so, fresh content is a valuable add on to your SEO strategy. One important thing to remember: personalize your website. And by this, I mean that you should design your web with a touch of your company’s character. Even if you are marketing your products and services, it doesn’t mean that your target audience should only be able to understand them. An effective website should also introduce the company and its profile in creative ways. 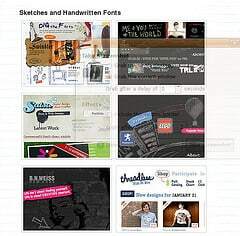 What other trends are you seeing in web design for 2011?